(David en route to winning the 2015 M45 Scottish Masters title at Kilmarnock. Back in 2008 he was first M35). 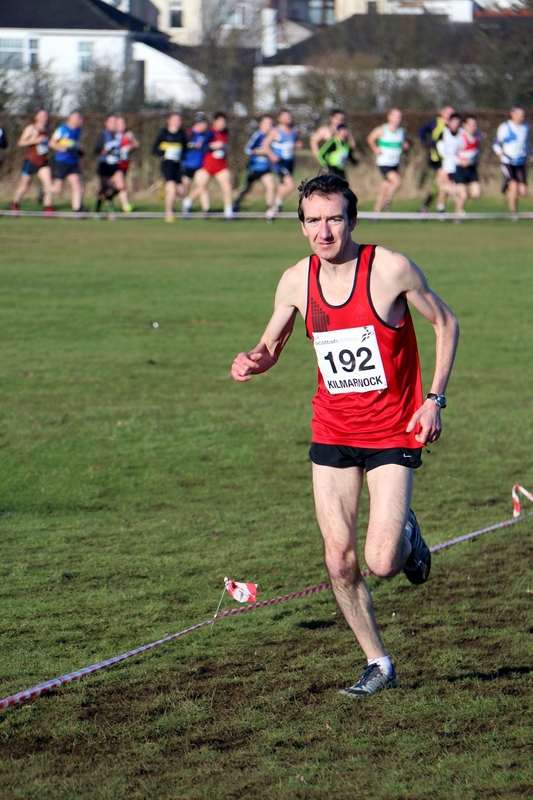 David has a very fine record in the Tom Scott Memorial 10 Miles Road Race: winning outright in 2007; finishing first M40 in 2010; and winning Scottish Masters gold medals in 2011, 2014 and 2015. Yes, I think the group at Irvine AC (I’ll always think of it as AC) were most influential – they helped me serve my apprenticeship in the running world. We had a great group of experienced and quality club runners and that helped me build up my knowledge of the history of the sport and all the events plus training methods. Firstly, the fitness and health benefits. However there is a tremendous social side and I’ve met a lot of good friends and indeed my fiancée through the sport. I enjoy the racing and competition as well – although I’ve always loved training so will always run even when I lose the competitive edge. Living in Ayrshire, it’s always easy to get out into the country or to the seaside and running enables you to get out and enjoy being outdoors in a nice part of the world. I think I’ve been pretty consistent over the years and I’ve won loads of races and titles. It’s difficult to rank preferences but in particular I’ve really enjoyed some of our team successes. Running with a relatively small unfashionable club, we really punched above our weight at times. Some great performances in the old (and much missed Edinburgh to Glasgow Relay) including the Meritorious Award, silver in the West District Cross Country Relay and silver in the National 6 Stage Relays. I remember having watched the top guys in previous years coming flying up the final hill at Livingstone and it was a great feeling to replicate that, coming up in first place after my leg. I’m pretty proud of my consistent record over the years, my pb at the Glasgow Half in 2007 was a good memory (67’01 and second UK athlete) but looking back and seeing a series of road races where I’m hardly ever out of the top 3 over a sustained period of years is pleasing – I like to think that I always raced hard and gained the respect of my fellow racers in that way. Thankfully I’ve been fairly consistent and not had too many bad runs – for years I was almost metronomic in my 10ks and could almost set my watch by when I would finish! I can’t think of any real disasters, although my only marathon (back in 2000 when I was only really playing about with running) was a bit of an eye opener. I completely hit the wall, finished in 2.45 but that must have been about 20 minutes for the last two miles with rubber legs! As I said I’ve done fairly well and achieved a fair bit both individually and as a team. I’ve always been driven by times and tried to run as fast as I can – I suppose the only unfulfilled ambition is more of a lingering doubt as to whether I might have been able to go faster if I had started younger. Having said that, starting later has maybe helped longevity. So although acknowledging the passage of time, I’ll still be trying to run as fast as I can and maybe it will be season’s bests as opposed to personal bests that I will have to start aiming for! I enjoy being outdoors and do plenty of walking (does that count as added training?). I also like cycling but that does play second fiddle to running and tends to be neglected when I’m fit – mind you a year of cycling when I missed all of 2013 with Achilles problems was a great way to keep fit and also a good way of reminding myself how great running is. In terms of other sports, many of my fellow runners will know I have a weakness in my support for the team representing the blue half of Glasgow. As I mentioned health and fitness and the social side. Also, it’s a great way to get out and about and you end up seeing a lot of places, from an industrial estate in Clydebank to the West Highland Way (and that’s just this year) – you see it all. I enjoy being part of the running community and have met some great friends. And then I’d have to kill you! Seriously though, as I have a fairly lengthy commute to my work in Glasgow, I have always tended more towards the quality rather than quantity. So I aim to get plenty of bang for my buck in training – as my club mates will tell you I’ve still to learn about the concept of the “slow run”. So pretty unscientific really.